As we come closer to game day, the analysis of who will win the National Championship game becomes more and more intense. Every sports analyst, reporter and sports fanatic spew out their reasons as to who will win come Monday January 12 and why. When it comes to sports, especially football, I think it is safe to say that most fans think they know exactly what they are talking about all the time. I’m not saying there aren’t a select number of fans that truly do know what they’re talking about, but in my opinion, we should leave it up to the professionals. For example: Jimmy Fallon. Now I know what you’re thinking, “Fallon? That guy that’s on television late at night way past my bedtime that everyone says is funny and stuff? What the heck does he know about football? !” I know at first hearing this is a little baffling but just hold tight, it will make sense in 3 minutes and 38 seconds. On Jimmy Fallon’s late night show he determined exactly who would win the National Championship and quite accurately in my opinion. How? Puppies. As a Duck fan I have got to say, these are some smart (and incredibly adorable) puppies! 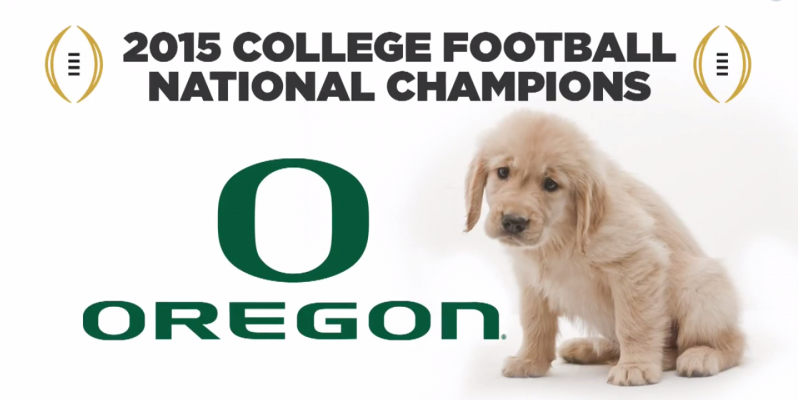 If and when our Ducks win the National Championship game, I sincerely hope those puppies are adopted by Duck fans. Also, if you’re a Duck fan that has been trying to convince your parents to let you get a puppy just show them this video and explain that you have to have one of these puppies because they’re so smart and were born Duck fans! How could they say no? My parents are in Arizona but… can I PLEASE get a puppy now?! (They always say no to this question). Goodluck to the rest of you. Go Ducks!